Who doesn't love castles? There’s something majestic about them that lures out both the suppressed romantic and the inner warrior. Given that most of us can’t afford a castle (that would be amazing!!!)... how can we capture even a hint of the alluring qualities of a castle? Gothic or Medieval interior decor is all about elegance and drama. When you are choosing a palatial theme like Medieval, then you can pick rich colors like red, green, brown and gold in deeper tones. The most common are burgundy, dark green, and gold. Mix it up a bit too... try adding a burgundy accent wall with gold on the other walls. If you don’t want such bold colors on your walls, use them in your furniture, rugs, or accents instead. Add a softer, more neutral tone to your walls. Instead of keeping it simple and regular, look for designer tiles or fancy stones. And... keep them bare. When you picture a castle, you don’t see wall-to-wall carpeting. Castles had bare floors, usually made of stone. Also, hardwood is also an affordable option. Medieval theme has all the elements that can impress your guests the moment they enter your facility. Not only the flooring and ceilings, but the walls of your house should also be addressed while redecorating. Instead of keeping them plain and sober, you should choose interesting design options for walls. Some ideas to consider are dragons, gargoyles, and human skulls. Make sure that you let the natural light enter the house. In addition, you must have wall sconces. Wall sconces give you the mystery and charm of a true castle. As a more subtle approach, you can use stylish lamps and small ceiling lights to create the drama of the medieval period in your house. Check out this great Wrought Iron candle holder wall accent! It's perfect! The scroll pattern...the color... Everything about it screams medieval elegance! In order to give a medieval look to your home, choose the right accessories... and long, flowing, drapey curtains. Properly castled window treatments coverings will puddle on the floor. An easy Castle themed element for the kitchen.... Copper pots!! Nothing says "medieval castle" like copper pots hung in your kitchen! If you aren't into the full hanging pot look, just add a few copper touches in your kitchen. Skeleton Keys add the perfect touch of Medieval drama to your home! Available in Rustic Bronze & Gold. How about this Human Skull as a study buddy on your desk? or a great shelf accent? Human Skulls make great accent pieces to give your home that medieval, gothic look. I mentioned adding a Dragon Head as a decorative accent... Check this one out! An ode to the Game of Thrones and Dungeons & Dragons, this Dragon Head symbolizes one of the most popular mythical creatures of our time! And the detail in this piece is incredible!!!! Check out the piercing red eyes!!!! For more design inspiration, check out Affordable Kids Room Decorating Ideas! Decorating your Kids Room can be challenging. You want it to be a place that your little one loves and wants to spend time in. Add some MAGIC! Whether it's a baby Nursery, big Kid makeover or Playroom overhaul.... adding some creative whimsy is never a bad idea! BUT... you also need to be sure it is a practical space for play, storage, and school work. And, of course, the added stresser of designing it so that it will adapt as your child grows! After all, you don't want a major renovation every few years as your child matures. Here are some decor ideas for boys and girls alike! Display your kids fave art pieces, or select paintings or pics of your kids with their friends or family! Walls adorned with gallery-style wall decor adds an element of "art" and creates a focus in the room. Choose color frames of all sizes and colors that help compliment the color scheme in the room! A great accent to your Kids Gallery wall is the finishing touch! The Jurassic faux T. Rex Head (left) allows your childs imagination to run wild as they go back 66-68 million years ago to the Jurassic and Mesozoic eras! Your child will RAWWRRRR over this realistic looking dinosaur! Or... Do you have a Shark Lover on your hands? Check out this magnificent Shark wall decor! (right) Notice the wallpaper... easily grows with your child! The accents of black and gold add a level of sophistication to the space! How about a Magical, Whimsical Unicorn for your little girl!? This Unicorn (right) wall mount is the perfect addition to any Unicorn lovers bedroom or playroom! Your little girl will enjoy the magical, hand crafted detail of this mythical creature for years to come! Perfect for a nursery too! All of these tips (above) can easily be phased-up to more mature decor as your child grows! Swap out the pictures on your Gallery wall with updated kids art, photos, etc... and repaint or add new, more mature picture frames. Your child's Wall Charmer can easily be incorporated into a tween/teen bedroom with a few simple changes. Try framing a small space on the wall, and hanging it as a centerpiece above your child's bed! The shelves that were once home to brightly colored toy bins can be replaced with wicker or even metal baskets to bring a mature, more sophisticated vibe to your child's room. And of course, add some other accent pieces like dried flowers, and colorful accent pillows and throws for a space that she, and all her friends, will love to hang out in! ✔ Organization and Functionality is a MUST! Paint a section of your child's wall with chalkboard paint for hours and hours of drawing fun! As a kid they will love it... and as a tween/teen... it becomes a space to write inspiration quotes, homework assignments, phone numbers... and more! At age 5, your little girl is all about everything pink and purple and sparkly! But that could, and likely WILL, change in the coming years. So, rather than going all out Princess on her walls... choose a more subtle tone and accentuate with colorful decor accents. Choose white, or a pale lavender for the wall color and add POPS of bright Pink, Purple and Sparkle in your design elements. Add a brightly colored comforter and some wall decals of her favorite princess or a FUN whimsical painting to tie it all in. As she grows, these things are so much easier to remove and swap out for decor that better aligns with her taste. Cast Iron Arrows and Anchors are a great rustic touch for an older kids room. The same goes for boys... choose a softer blue, green or even gray wall color. These are neutral colors that can be transformed easily into a space fit for a teenage boy! And patterned wallpaper is always a good choice to add some depth to the space. ✔ Some other Decor Accents that are a BIG hit! Add a touch of Gothic/Medieval to our older child's room. You don't want to go too dark/Goth... just a touch adds some sophistication and class to the space! This realistic, life-size Human Skull is a great addition! An ideal study buddy placed on your child's desk! Compliment this piece with some metal wall decor, like a Skeleton Key! Or how about a Dragon? An ode to the Game of Thrones and Dungeons & Dragons, this Dragon Head is a sculpture that symbolizes one of the most popular mythical creatures of our time! The Perfect addition to your Dragon lovers room!! Redecorating your Kids room into a fun and functional space that transitions into a space fit for a tween or teen can be easy and affordable! Just swap out the "baby" stuff with add some "grown up" accessories and...viola!! 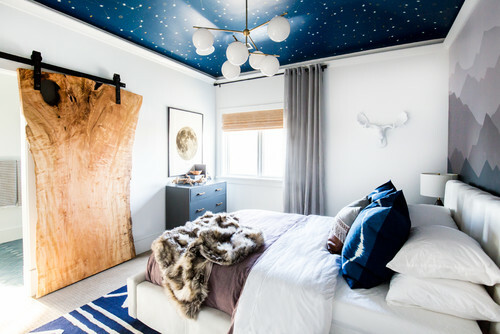 Check out this Nods to Nature and ‘Star Wars’ in 2 Boys’ Bedrooms and Bath decor! (click the link to see more pics) Amazing! The perfect compromise when your 2 boys share a room and have different interests! For more design inspiration, check out some tips to give your home a much need Spring Makeover! It's amost Springtime! Give your home a Fresh, Spring Makeover!! To celebrate the end of this cold winter.... we are welcoming Spring with some fresh decorating ideas to help brighten up your home! From pastel color palettes and floral accents to fresh patterns and a few new farmhouse decor accent pieces you can easily add that fresh Spring feel to your home! You can go all out...or just change out a few decor items for a more subtle change. Sometimes all you need is a touch of the outdoors and a Pop of color to make all the difference. The simplest farmhouse vase is an old mason jar! Paint it a pastel color like mint, pink, yellow or blue. or leave it... it's your choice! Then pick a bunch of your favorite flowers and viola!! Fun Tip: Put a few drops of food coloring in the water, then cut the stems and insert some white carnations or any other white flowers of your choice. The flowers will absorb the colored water and will turn color! Super simple & easy!!! Allergic to flowers? No worries.... in place of real flowers fill your mason jar with silk flowers, potpourri.... or even jellybeans!...yes.... jellybeans! Super colorful and Easter-ish. But definitely keep that jar up high, away from the little fingers of the kiddos. Nothing spells disaster like a kid on a sugar high! Another Tip... Mason jars make excellent Candle holders!! Silk orchids are always a nice touch to brighten up your mantle! And when paired with the perfect metal wall decor it, adds a delicate contrast. Switching out your table centerpieces is an easy way to make a subtle change for the season. For Spring..try the Organic look. A wooden box is a great for planting some grasses or low growing flowers, or use it in your kitchen to keep your favorite herbs handy for cooking! A galvanized metal bucket for use as a vase or flowerpot adds a definite farmhouse feel! Give a neutral room a fresh update with a mix of floral patterned fabrics. Spring is the perfect time to replace those old curtains and drapes. Try a new pattern, or... if you aren't a fan of patterned fabrics, simply update to a more Spring-y color! This season, there are some amazing floral prints hitting he shelves that are a must have for the perfect Spring look! Go bold or simple...it's your choice! And don't be afraid to mix and match patterns... as long as use colors within the same palette you'll nail it! Find this modern, floral pillow (right) at Wayfair. To go along with your florals.... bring more of the outside in with leaf prints. Create an accent wall with a leaf print wallpaper if you are going all in on this makeover... or add a subtle leaf pattern to your gallery wall with a stencil. To complete the look, your accessories should either be among the same color palette... or find some awesome throw pillows with a leaf print fabric. Fern prints are always a hit!! But be careful not to overdo it... it's easy to go from chic to tacky... with just one printed fabric too many! Say goodbye to dark, deep tones... Let the Sunshine in with soft pastel shades.. or even neutral shades of white! Whether it's just one room or many, freshening up your walls is sure to bring some of Springtime indoors! ✔ Mint green is a great choice... it's making a comeback and is a very calm, modern tone. It pairs beautifully with natural wood accents as well as metals! ✔ And don’t overlook lavender. Lavender is a classy, neutral color that works beautifully with a wide array of other colors. Great for bedrooms! Pair it with other pastels or neutrals like gray, ivory, and white for a soft look. ✔ Cast Iron Wall Decor! Helps to break up the "pretty" but adding an element of rustic. It compliments the pastel colors beautifully. Try some Cast Iron Arrows, Single or 3-Set Arrows... or maybe a Rustic Wall Anchor. A great way to fill in blank space on a gallery wall or just to give your wall a bit of dimension. Skeleton Keys are a big hit! A great addition to any farmhouse decor but also lends a hint of old world with a subtle Gothic or Medieval vibe. A fun decorative accent for any bedroom or office! Available in Rustic Bronze or Gold, these keys will add a nice touch to your makeover! ✔ Faux Taxidermy... adds an additional element of the outdoors to your home while creating a fun, eye catching focus to your decor! Our Faux taxidermy collection is A Fusion of Nature and Decor and hand finished in Sunny Arizona for a piece as unique as you are! I love this Spring blue wall color paired with the fresh white wicker baskets! (right) The perfect farmhouse touch. And the Faux Taxidermy Virginia Deer Head wall decor adds an element of POP to this bathroom! ✔ Rustic Wall Shelves are a great way to display a vase of beautiful flowers, memorable pieces, or even paintings and family portraits. Find a great ledge shelf that works in your space and hang it on your gallery wall or anywhere you want to add some focus. ✔ Add some Time!! Why not add a new rustic farmhouse clock to the mix? With so many great new styles, you are sure to find the perfect fit for your space. "It's gonna be a Bright, Bright Sunshiny day!" in your home! For more design inspiration, be sure to check out Farmhouse Decor Inspiration... Some of our Faves! Farmhouse Decor Inspiration .... Some of our Faves! Choosing the right decor items isn't always easy. It requires some thought and foreshadowing... does it go with your current decor? Is your color scheme all wrong? Size... is it so big that it's overpowering? Too small and gets lost in the mix? You want your decor items to stand out! To POP! Incorporating them the right way is a must! Let's start with a few smaller, simple items to fill in some dead wall space. There's nothing worse than spending your time finding the best paintings, or family photos to frame.... oh, and then there's the added task of choosing the right frames... for the perfect Gallery wall and end up having it look like there is something missing! Small, subtle items can really help finish off our look. Take a look at this Arrow Wall Mount! (right) It's the perfect size to fill in the space between some differently sized picture frames. Our Cast Iron Arrows have dual key holes on the back so you can vertically or horizontally..whichever way best suits you! Another one of our faves.... this Distressed Bronze Skeleton Key (right). It fills in the blank space perfectly without overcrowding. What's perfect about the Skeleton Key is that it goes perfectly with any Farmhouse motif, but also... with the right complimenting accent pieces, is Medieval, or Gothic, as well! Bonus! Find this, as well as the Cast Iron Arrow, at WallCharmers. Nothing says Rustic Farmhouse like our next favorite! This Weathered Rustic Windowpane Wood Wall Plaque is the perfect addition to any living room or bedroom. Stand it against the wall on a rustic wood console table or dresser or hang it on the wall! You can even get extra creative and use it to display your favorite vacation photos, or school pics of the kiddos! Let's talk about accent lamps! The right lighting is always crucial when decorating your home. With Farmhouse decor, depending on whether you are going for the Classic Farmhouse feel, or a more Modern Farmhouse look you could go in a number of different directions with this one! You could opt for an uber rustic floor lamp like the one featured left. It goes perfectly with a more Rustic, Classic Farmhouse look! A great compliment would be to add a Longhorn Cow Head Wall Mount! Sure to make your wall POP! Both of these lamps are available on Wayfair. Texas Longhorn Cow Head available at WallCharmers. For a more modern lighting take.... try this Arched bell, lantern style floor lamp (right). It's not as rustic, but still adds the element of farmhouse with the hanging lantern light effect! And, if I might add, the wall color is the perfect neutral palette to compliment the lamp and hanging mirror. Faux taxidermy is a great rustic touch to any decor style! ... and incorporates beautifully with any Classic or Modern Farmhouse style decor! Check out this black and gold Longhorn Cow Skull! It adds a rustic POP to this gorgeous breakfast nook! The additional rustic features including the Farmhouse sign plaque and the gingham patterned dishes are a great addition! Oh, and the rustic wood ladder is the perfect finisher to this wall! Not a longhorn skull fan? Try a White Faux Deer Head or Skull instead! Or even a majestic Moose Head or a beautiful Bison Head! You can find all of these great Faux Taxidermy items at WallCharmers. These are just a few of our faves! Find the Farmhouse decor accents that speak to you and easily incorporate them with the overall flow of your home! Need some Design Inspiration? Check out Farmhouse Design Inspiration Sources to help get your creative juices flowing! Introduction to Farmhouse Decor. What is it? Do you ever wonder about different design styles? Like, how they came about and what their key features are? Maybe you haven't thought about it, but want to spruce up your home with a different look and you need some inspiration? Ever since Chip and Joanna Gaines' hit show Fixer Upper, I've been curious. I mean, who hasn't, right? Their design styles were so different and rustic than what I was used to, but also modern and elegant. So, I started researching the Farmhouse style and what it is actually about. Classic farmhouse is cozy without being cluttered. It's similar to country style, but while country tends to lean a little towards "showy" and sometimes "overdone", farmhouse design is more about simplicity while maintaining a certain level of sophistication. So, for a classic farmhouse look, minimize and don't over do it with your decor accents. Farmhouse style is often associated with the refreshing simplicity of the Midwest, but your geographic location doesn't have to limit your love for this trending look. It's all about combining different elements together without overdoing it. Wide plank floors, big, comfortable furniture, farmhouse patterns, cozy throws and pillows, wrought iron and cast iron design elements... all key parts of achieving the perfect Farmhouse look in your home. Farmhouse interior design is the perfect balance of old and new, blending rustic simplicity with modern sophistication for a cozy feel. Check out the sun room in the picture above. Not overly farmhouse, but subtle touches of the design style. Introducing different fabrics and textures, rustic wood elements, even a touch of faux taxidermy, created the perfect farmhouse space. Not sure how to create it? Take a look at some simple design tips below. That's always the hardest part of designing your home, right? What colors should I choose? For a farmhouse look, your main colors should be lighter shades of neutrals and pastels. Simple. You want to layer that with more earthy colors to capture the traditional farmhouse feel. Then introduce more natural looking color with flowers, throw blankets, pillows, and accents. This keeps the space feeling clean and fresh. Distressed metal, concrete, or white subway tile adds a touch of industrial flair, while fabrics like linen, cotton and jute contribute to the simple vibe of farmhouse spaces. Remember, Farmhouse decorating is all about relaxed and comfortable patterns including stripes and florals, plus touches you’d see down on the farm (yes, I said it..farm!) so think birds, gingham, maybe a faux deer skull or faux cow skull, vintage signs, or rustic metal arrow decor, to add an accent to your wall. As you can see here, @blessonbluefinch captured the perfect farmhouse look in her kitchen with a rustic wood piece to display her beautiful dishes and books and that fabulous antique clock! She incorporated florals and gingham patterns in a subtle way while keeping her wall color soft and neutral.The wood sign is the perfect touch and the longhorn cow skull adds an extra POP to her wall! And don't you just love the old mailbox she used to hang her coffee mugs?! What a great idea! Set the tone for your space with eye-catching, modern light fixtures, or exposed bulbs with an industrial feel. Take a trip to your local flea market or visit yard sales to find antique items and modern accents to keep your space feeling homey and comfortable. You might be surprised at what you find! Need help designing the perfect Gallery Wall? Check this out! Small-space decorating can be a challenge, but we can help you make the most of the square footage you have. Learn how to maximize and decorate small spaces with these tips. You need space for the essentials, but even the most perfectly decorated small space doesn’t work if you can’t walk in it. Try floating shelves and nightstands, to keep the floor clear and create space for extra storage beneath if needed. Opt for sconces and wall lights rather than floor lamps. Yeah, sure, you need a desk and a dining table... but do you need them 24/7? You’ll free up floor space and avoid the clutter that gathers on them if you choose a folding desk or table. If you have a one-wall kitchen, folding doors can conceal clutter when not in use. Small spaces can often end up seeming dark due to lack of windows. Make up for the lack of natural light by adding plenty of light sources in every room, from the kitchen to the bedroom. Combine ceiling fixtures—either a pretty pendant or elegant flush mount, depending on your ceiling height—with sconces or table lamps for a cozy and bright atmosphere. If you’re not blessed with an abundance of natural light, mirrors can help reflect the light you do have around the room creating the illusion of a larger space. Try lining a wall with a large mirror or creating a gallery wall of different sizes and shapes. A rug is the one item you definitely don’t want to skimp on as far as size goes. A rug that it too small will make the feel equally small. Choose a rug that’s large enough so most of the furniture will sit on it. There are only so many things to look at in a small space, so make sure they all fit. Stick to a limited color palette, whether it’s light and airy or dark and dramatic. Make the most of your space by choosing furniture that also doubles as storage. Opt for a bed with built-in drawers or benches and ottomans with space to store away extra blankets or sweaters. A daybed can serve as both a sofa and a guest bed. No need for Miniature Furniture - Size it up! There’s no need to use pint-size furniture and decor in a small space. You can use regular-size furniture and large-scale art; you’ll just need to use fewer pieces in the room overall. Be sure to choose a few eye catching statement pieces. Some decor items for your small space design! Arrows in home decor may have started out as a trend. But this geometric decoration has gone from trendy shape to timeless icon. Our cast iron 3 set arrows are the perfect Farmhouse touch to add to your decor! Our Longhorn Cow Skull makes a great addition to any wall! This wall mount brings the rugged west and rustic southwest into your home and is a great conversation piece! Need a chic, rustic option for hanging your scarves, jewelry or light jackets? Our Rustic Antler Rack is the perfect addition to any decor. Available in white, gold, or bronze! For more design inspiration, check out our Design Tips for the Perfect Gallery Wall!